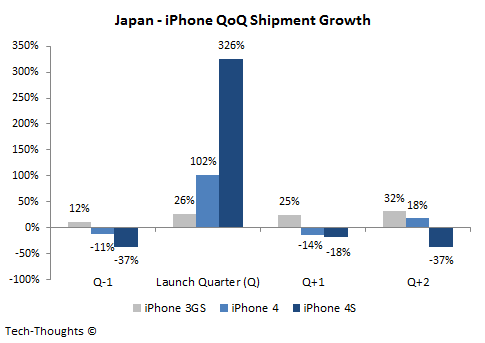 In my last post, we had estimated 150-170 million global iPhone sales over the next four quarters, based on the impact of the last three iPhone launches on QoQ growth patterns. 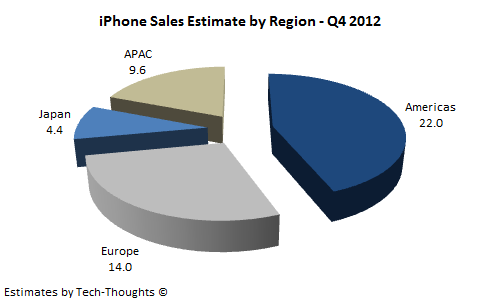 Now, let's use the same methodology to reach a realistic sales estimate for the iPhone for each of Apple's non-retail operating segments (regions), i.e. the Americas, Europe, Japan and APAC. 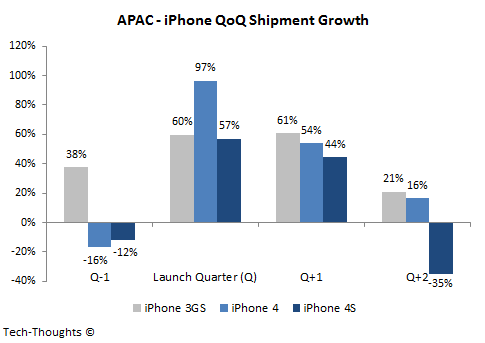 Since the iPhone's average sales price (ASP) is fairly consistent across geographies, we can get a decent estimate of region-wise iPhone shipments, by looking at quarterly shipment figures and Apple's revenue break-up by operating segment. 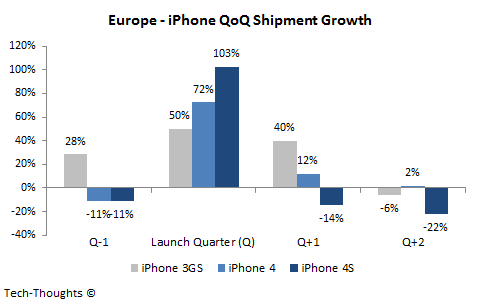 Since the iPhone has grown very quickly to become the largest revenue driven for Apple, the shipment break-up by region should get more accurate for more recent launches (iPhone 4 & 4S). What I've done is segregated the shipment data by time period. So the majority of iPhone sales after a launch would belong to the newer model (until Apple re-launched older devices with the iPhone 4S last year). Out of phase sales should roughly be balanced out over the time frame. 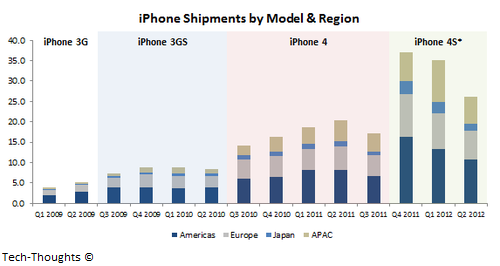 So specifically for the chart titled "iphone shipment by Model & Region" you have taken the raw data and applied assumptions as to "% of shiptment attributed to a specific model and region"? If so what are some of the assumptions that you used to come up with the data for the chart? I was planning on using your data from the chart but I need exact numbers. I looked at their 10K and couldn't find a breakdown of their revenues by specific iphone model or shipments of iphone by model so I am wondering where did you get your hands on such awesome breakdown to data :)? Pretty much, yes. I had to use a few assumptions and proxies to break the data down by region and model. I already explained the assumptions for the model breakdown. For the breakdown by region, I mentioned my assumptions in the post. 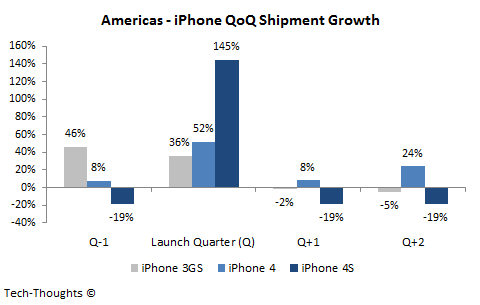 Since the iPhone forms a majority of Apple's revenue and ASP is roughly constant across regions, I applied Apple's revenue break-up by region to iPhone sales. This would be more accurate for the iPhone 4 & 4S because when the 3GS was launched the iPhone was a lower proportion of revenue. Apple doesn't usually reveal that data, so getting your hands on something exact would be very difficult. That's why I've used comparable proxies wherever possible. That is great insight. 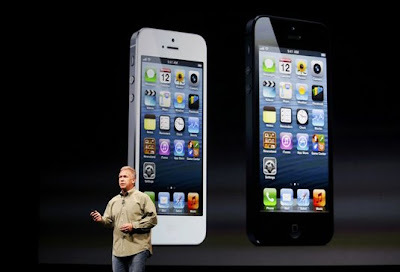 I followed the link that you posted above and it has nicely presented revenues for iphone from 2007 and onwards. I guess I could just relate the price change directly to the revenues. But I might still have to segment revenues by model which would mean knowing the number of units sold for each model and the price. So I would still have to go this route. Thank you for sharing and giving ideas on how that model could be built. Would you be able to share a more detailed chart so I could get the exact numbers of units by model and region. Thanks! Glad to help. Drop me an email (you can find it in the contact section in the navbar on top) and I'll send you the information.